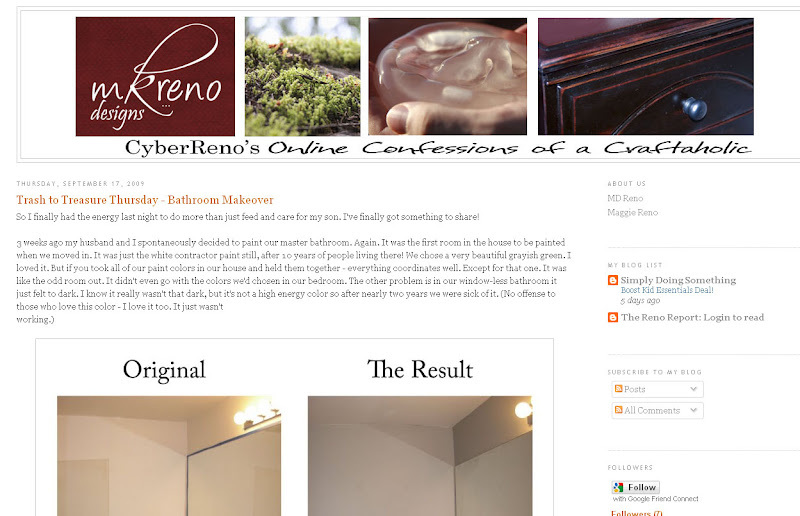 I have been wanting to update my blog ever since I changed it the last time. The old picture was stretched funny, and the design was just underwhelming. Someday I will have time to do something that I absolutely love. But first I have to find a layout I'm in love with, a name that I can use for a blog, a site and a shop, and then design it all. That's just a little too much today. For now, this quick update will have to do. Really, it is a very simple change. But I love change. I love to improve things! This really will make do until I can really spend quality time on it. Although it might change once or twice again over the next few days. You never know! I'm linking this up to Kimm's Trash to Treasure Tuesday at Reinvented. Also linking up to Kim's Get Your Craft on Party at Today's Creative Blog. Head on over to these party's to see other creative projects. I love your new header!!! Especially the picture of the jelly fish. So. Cool!